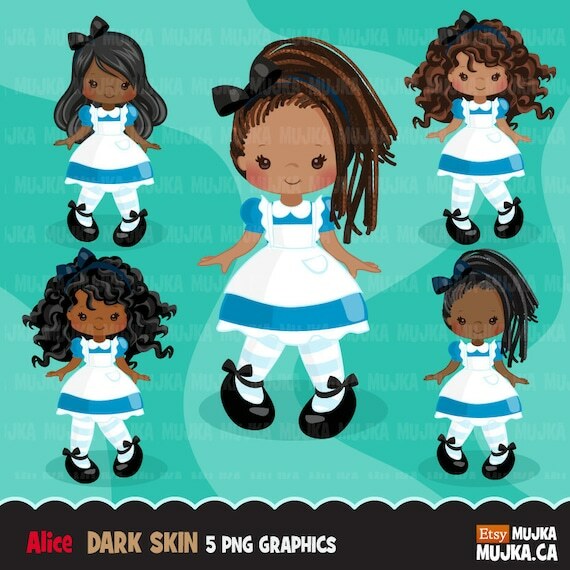 Cute African American / dark skin Alice in Wonderland characters, including Alice in different hair colors and styles. Perfect for invitations, party printables and embroidery. Mujka Graphics can be used : Digitized Embroidery, Personal Scrapbooking and limited commercial scrapbooking sets ( please ask before purchasing) Jewelry, t-shirt, tote bag and other surface printing, sublimation, cutting files, digital or printed invitations, chore charts and teacher resources, Designer cookies and cakes, digital stamps, pendants, bows, ribbons, planner supplies like stickers and backgrounds, digital printable PDF files, party favors, and many more uses.